In times where every second metal band adheres to the melodic progressive power metal genre, it becomes harder and harder to take newcomers seriously, so when a veteran band like Eldritch from Italy release a new album, I can hope for something more nutritional. And they don’t disappoint. 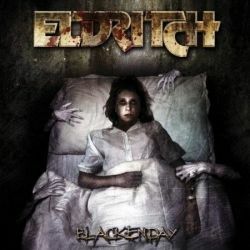 On their seventh album, with their debut released back in 1995, Eldritch continue the path they have chosen on their last albums. Of course they are not as brainy anymore as on their early works when they not only tried to emulate the techno thrash sound of WatchTower, but even took their band name from one of their songs. 2007 sees Eldritch not really improving, but also not yet stagnating. Twelve tracks in fifty minutes, this means that their songs are more compact than those of your generic prog band, and where Dream Theater nowadays hide lame songwriting behind voluminous song structures, Eldritch concentrate first and foremost on accessible melodies backed by crunchy power metal that sometimes nods into the direction of thrash metal, something they did already in the past. Are there any highlights? None that I can make out, but Blackenday moves on a constantly excellent level, continuing the good work of its predecessors, and therefore earning exactly the same rating as them.